Announcing our FIRST on the FIRST! Race will take place at Creekside in Gahanna on a new recreational course. Our start/finish line will be at the Gahanna Golf Course Clubhouse. We are also packing lunches for the homeless right here in Columbus. Join us and start 2016 right. Be the LIGHT! See more race details and information about registration here. We are also seeking sponsors. Please contact us for more information if your company or one you know is looking for a way to encourage people in health and impact in the communit in 2016. These are absolutely adorable (in also a manly way) and practical. You can #RACK with these anywhere there are people and germs! 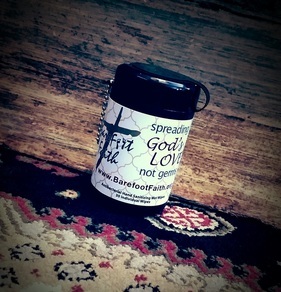 This is a mini canister filled with 30 antibacterial wipes with a slogan, "spreading God's love not germs". Get five to give away for $5 donation. Limited quantity available. Excited to share this new tool to help your family live on mission. If you have a relationship with Jesus, this is for you. YOU were called for a mission. Don't miss out on why you are on this earth for all the earthly things that just take up time and pull our focus from our purpose. ﻿Are you interested in how to live more FOR Him and not sure where to start? Thing is, it is in all of the small moments of life. In many cases, these ideas are showing a way to be intentional in what you're already doing. Believing that you were called to be where you are...now, to make a difference. If you have children, they will have a blast. You will use the worksheet to select some ways from the idea booklet to 'live on mission'. Track your RACKs in the Jesus Jar. Once you can get into practice and start filling your jar, it will become contagious. I'm sure that is something we would all love our kids to 'catch'...a light that burns so bright for Jesus, they can't help but SHINE for Him! Might help the rest of the family shine a little brighter too. Kits are $10 each and include: Instructions, a worksheet, RACK idea booklet, RACK cards, and Jesus jar. ﻿New in 2015, we are scheduling group workshops to help families make a plan to 'get on mission'. Don't let the temporary things of this world keep you from all God has for you. We desire to help families live the whole gospel verses going through the motions from a hole in their gospel. We have opportunities to serve with Barefoot Faith. If your group or church is interested, please ﻿contact us﻿. We are also interested in growing our church partners. Find out how we can be a resource to your church and together love on Columbus in greater ways. We are positioned as a local missionary and would love your support!